Wholesome coconut dahl with Indian spices on a bed of super grains. 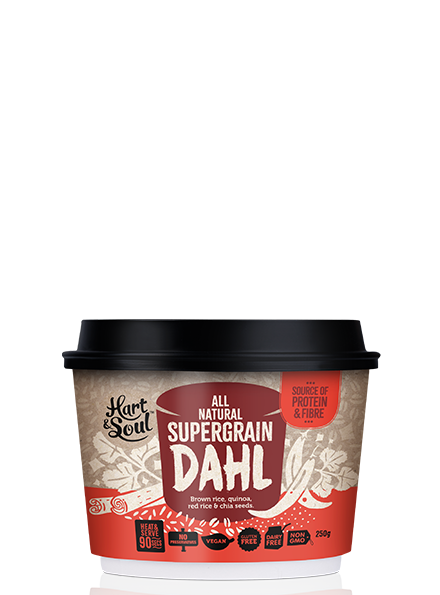 Dahl Sauce: Water, Coconut Milk, Carrot, Chili, Lentil (7%), Black Bean (7%), Onion, Mung Bean (4%), Coriander, Salt, Spices, Garlic, Coconut Sugar. Cooked Supergrain Sachet: Brown Jasmine Rice, Quinoa, Red Rice, Chia Seed, Rice Bran Oil. Made in a facility that processes: Crustacean, Egg, Fish, Peanut, Sesame, Soy & Tree Nuts.